The thing I’ve found really helpful in the last year is to control the music from my phone, using Spotify, via Bluetooth back to our sound system. So whether I am welcoming new kids, just finished playing guitar for a song, or am watching a skit from the crowd, I can make sure those transitions are tight. Obviously you can give this task to almost anyone, but they need to be on top of it. I’ve found that no one has an ear for the down time as much as I do, so I usually do it myself since it is so easy. 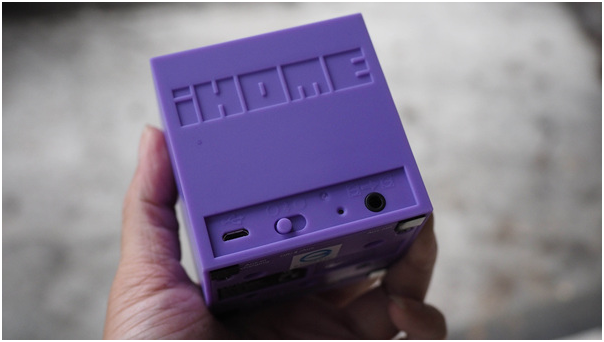 The product I use is the iHome Bluetooth Rechargeable Mini Speaker Cube – Blue (iBT16LC). I’ve found it as cheap as $20 at Bestbuy. The key is that it has an auxiliary output, just like a headphone jack on your phone/ipod, so that when you connect to it via Bluetooth you effectively can plug into your sound system. There are lots of similar items out there, and I’d love to hear about others that work well, but this one has been good enough for me. Spotify now has a “connect” feature so if your logged into the same account on phone and computer you can control it via Wi-Fi. Might be premium only, but it’s great and what we’ve been doing. Thanks Aron! Hope you are well. Q: On Spotify can you cue up where the song starts? Kyle, great question. To my knowledge no you cannot do that. That is a nice feature in iTunes. Alternatively, for like a song you use often for a camp sell or something, you could make an mp3 edited and then get it on your phone through iTunes and then Spotify will find that on your phone and you could use it. There may be others ways too but that is the first idea that comes to mind. Kyle – to cue to a specific place you have to start playing first, then you can scrub to the right location, so you would have to start off muted, then hit play to load it up, then pause and go to the right spot, then un-mute and play. Kind of a hassle (especially if you’re on mobile). I second Sean’s idea of creating edited versions, I still have a bunch of CDs of those exact things from back before portable mp3 players were a thing. Spotify has a local files feature that you can use combined with their sync so you could skip the itunes portion. I’m not a mac/iphone guy, and hate itunes, so anytime I can find a way to not use itunes I take it.